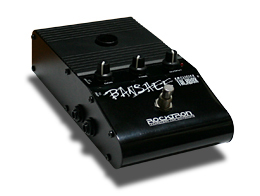 Rocktron Banshee is a talkbox with a built-in power amplifier. Power amplifier is obviously necessary for talkboxes without built-in amplifiers like the Golden Throat. Because the power amp is built inside the Banshee, all you have to do is connect your synthesizer to start performing. It is ideal for beginner talkboxers. Although it has a high cost performance, it has a relatively weak low-mid range. Depending on what is connected, because of its low power, it is great for practicing at home, but may be insufficient for use on stage. The characteristic of a nice talkbox sound is the warm attack sound just how a real vocalist sounds. With the Banshee pre amp however, white noise increases and the sound is more compressed as the gain is brought up; and after 70%, the sound is too distorted it is quite difficult to gain a warm attack. However, like I said it is perfect for beginners with limited budget. You could listen to the sound at the Rocktron website.